Comfortable: Suzlon Energy Ltd chairman Tulsi Tanti says the share sale will cut the company’s debt to Rs5,275 crore from Rs6,400 crore. India’s biggest maker of wind turbine generators Suzlon Energy Ltd raised $552 million (Rs2,186 crore) by selling shares to select investors to repay part of the debt raised to fund the acquisition of Germany’s Repower Systems AG. Suzlon’s board approved the sale of 11.4 million shares for Rs1,917 apiece, the Ahmedabad-based firm said in a statement to the Bombay Stock Exchange (BSE) on Wednesday. The company’s euro 1.2 billion (Rs6,840 crore) acquisition of Repower this year and a euro 465 million purchase of Belgian gearbox maker Hansen Transmissions International NV. last year increased debt to 0.75% of equity, straining Suzlon’s balance sheet. “We funded two large acquisitions by raising debt and that was a concern for our investors," chairman Tulsi Tanti said. “Our balance sheet is more comfortable now." The share sale will cut Suzlon’s debt to Rs5,275 crore from Rs6,400 crore, Tanti said. As ?many as 25 investors bought Suzlon shares, of which roughly 60% are Indian financial institutions and rest are foreign investment firms, he said. He declined?to?name?the?investors. Suzlon rose Rs37.70 a share, or 2.02%, to Rs18,99.50 on BSE on Wednesday. Roughly half the funds will be used to repay the debt Suzlon incurred to fund acquisitions of Repower and Hansen Transmissions, Tanti said. Suzlon beat Areva SA., the world’s largest builder of nuclear plants, for Repower with a euro 1.2 billion offer in February this year. Part of the funds raised on Wednesday will fund the expansion, he said. Suzlon plans to spend Rs2,600 crore on boosting generation capacity in India to 5,000MW next year from 2,700MW. The shares sold amount to 3.8% of Suzlon’s total equity, the company said in an emailed statement. “We expected Suzlon to dilute equity to remedy its debt burden but had expected a better price," said Mukul Jain, analyst at Mumbai-based brokerage Prabhudas Lilladher Pvt. 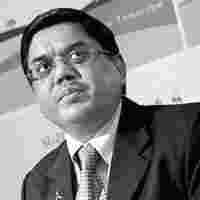 Ltd. “The sale gives Suzlon better leverage for raising funds for its expansion plans." Jain has an “outperform" rating on Suzlon. The company calculated the share sale price by allowing a 2% discount to the average of Suzlon’s share price in the last seven days, Tanti said. The price was at a 3% premium to Tuesday’s closing price of Rs1,861 a share. The company has overseas bonds worth $500 million due for conversion into equity over the next 24 months, Tanti said. This may add additional equity of as much as 4%. Suzlon may raise more debt next year for its capacity addition plans, he said. Suzlon will need to make an offer to buy a 30% stake that Areva continues to hold in Repower next year, according to its takeover agreement. A similar offer will need to be made the following year to buy out partner Martifer SGPS SA., the Portugal-based metal structures maker, according to Jain. Martifer and Suzlon Energy hold 57% of Repower Systems AG after a takeover offer for Repower.